Before the end of May, there will be five new slot releases by Microgaming. They games will be available on both desktop and mobile platforms. Ariana will be released on HTML5, Apple iOS and Sndroid on 6th May. The game will be available on all the Microgaming casinos on out site such as BETAT casino, Bet365 and All Slots Casino. This slot is set to give you an ultimate boat trip. The slot bears 5 reels, and 25 pay-lines. From the slot you will enjoy wild spins and free spins. When on the free spin mode, you will have the possibility of having only two symbols trigger a win. For the free spins, land on the reels 3 or more symbols. As you may pick from the name, you expect to have penguins in play on the slot. Microgaming takes you on a journey describing the tale of Arctic penguins on high-dive. The slot has 25 paylines and features 5 reels. To land on the free spins, be sure to collect penguin scatter symbols. 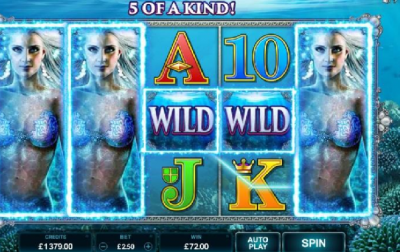 This is a new Slot by Microgaming which is based on aquatic adventure where a heroine swims to look for treasures by swimming deep in the ocean. To give this slot the depth it requires, rich blue colour tones have been added. The slot has 5 reels and 3 rows; also bears 25 fixed paylines. The wild symbol for Ariana will fill the place of any missing symbols, 3 or more scatter symbols which are represented by the starfish will give you a bonus of 15 free spins. Microgaming has the right to boast with the unique release of Ariana where they will launch the slot simultaneously on download, Android, HTML5, Apple iOS and flash platforms. This launch is coupled with a network promotion which will see a lucky player being sent off to Dubai for a luxury vacation worth €6,000. The big chef slot also has a fixed payline system but has 15 paylines. The slot has 5 reels and 3 rows. From this slot expect the magical powers of scatter and wild symbols. These symbols can bring to your table sweet delights of 10 free spins and two times multiplier. Be ready to be taken for an adventure like no other; your heart might start thumping when you hear that you will be setting out for an adventure. The one Microgaming has in mind for you will not make you fret at all. Enjoy the HD quality which will thrill your gaming and still maintain the original feel of a slot game.